For all of those fans of LOTR "inspired" designs, I have a new one coming from Christian Fletcher. It is a slightly modified version of his standard Borderwatch with the AT1313 blade. 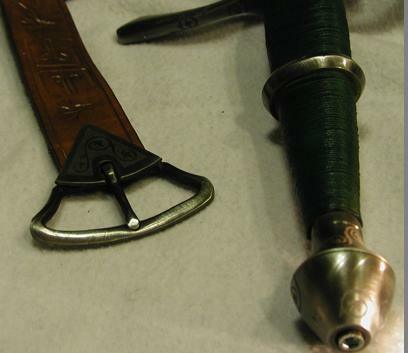 The main features are some leaf and vine etching winding around the chape, locket, guard, pommel, and on the buckle and tip of the belt. 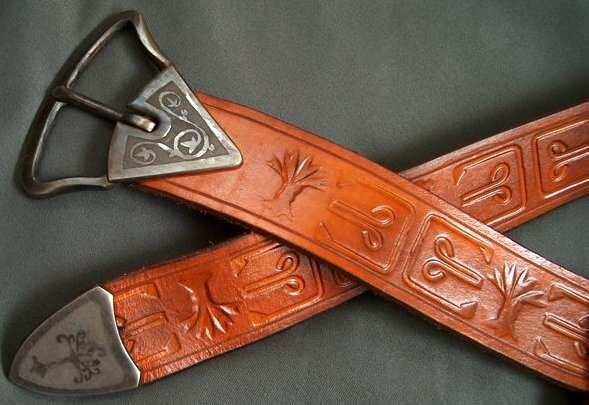 In addition, he modified the chape slightly, added a tree motif to the tooling on the belt, refined the shape of the belt buckle, and included a hand-forged buckle for the suspension. I gave Mr. Fletcher some ideas, and instructions that he should feel free to deviate as he saw fit. I told him that I was looking for an elegant, but not ostentatious, fantasy piece. One that would reflect the character's heritage, including both the human and elvish influences. I located the leaf and vine design (supposedly historical english, but origin unknown), and suggested that they might look good on the locket and winding around the chape. I don't know of any historical examples using this ornamentation. 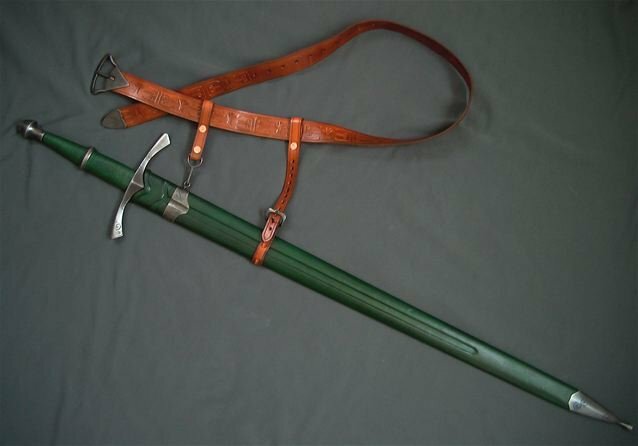 He suggested also wrapping around the pommel and the guard. I suggested maybe doing something with the buckle, but all of the updates to the belt were purely his own initiative. I think I'm going to be very pleased with the result! I don't have it, yet, so I'll need to provide an update when I have it in hand and given it a closer examination. In the meantime, here are some pictures that CF took. Your new Borderwatch looks really nice, Doug. I am not familiar with the standard Borderwatch, but the etching, I am sure, adds a lot. Is the green color-scheme the standard, or your selection? Is the green color-scheme the standard, or your selection? Christian Fletcher has several standard colors, and the ability to do custom colors. I was originally going to go with "Oxblood," but in the movies, this piece was green. So, given that it is inspired by that piece, and that most of the rest of my collection is Albion Oxblood or magenta, I decided to keep to the green for this one. 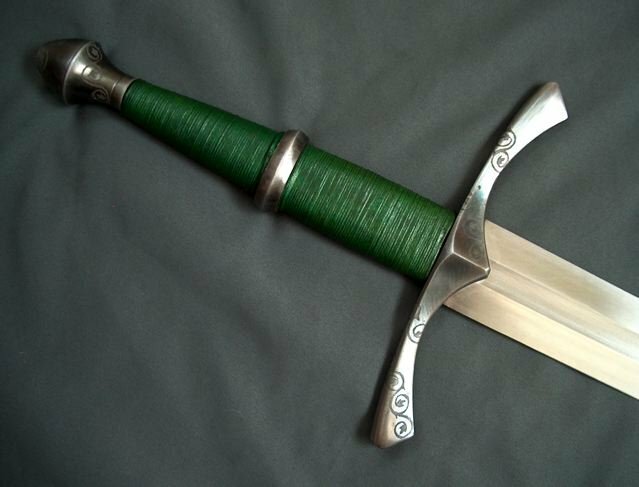 You can see his standard Borderwatch by going to http://www.Christianfletcher.com looking at Swords> Angus Trim> Contemporary. Nice, Doug! My favorite part is the decoration on the belt. That's awesome! Wow, I look forward to more pictures. I am sure Tolkien would approve. LOL! I'm doing a job on a Borderwatch at the moment myself. Its for a customer and I would rather he show it off first though! You are going to love that Borderwatch and Christian is a wizard! Tom Carr wrote," LOL! I'm doing a job on a Borderwatch at the moment myself for a customer..."
Gentlemen, I AM that customer !! Seriously though, I like the etching you've done on your pommel and guard very much and I think it adds a great deal to the overall motif. The guard and pommel on my Borderwatch has been simply blued and aged which I also like. I was considering antiquing the blade but I'm of two minds on the subject. After reading a review of the antiquing process right here at myArmoury, I realized that the process by definition wreaks havoc on the blade edge, though the results [ when done well] are very impressive. But since I enjoy cutting with this sword I'm not sure I want to see it's fine edge forever compromised with rusting. The Borderwatch is one of my favs, maybe the favorite sword in my collection. By the way, when I unvail the work Tom is doing to my Borderwatch in a picture rich review.......hoosah !!!! PS- I LOVE the etchings on the scabbard tip as well. Agreed, That is some excellent detail work. I especially like the etched detail on the buckle plate and belt end! Very Nice! Thanks, gentlemen! Kevin, that was exceptional work you posted on the Maker's forum, too! Very nice! 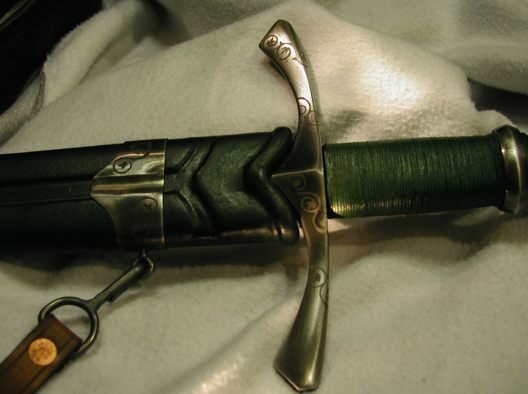 I have a few more pictures, showing the etching on the hilt and locket. The new one of the hilt shows how the design winds around a bit better, and it is also a bit easier to see the pommel. The lighting in the first picture made one of the winds disappear. I agree about the belt buckle. Very well done! 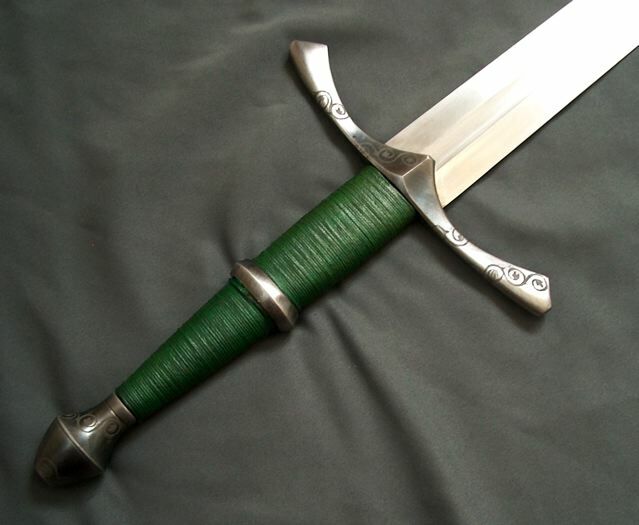 But, from what I understand about etching, the real impressive work is on the sword and scabbard. Thinking a moment about how that had to be executed with etching, the resistive agent had to be painted on everything EXCEPT the design, and with no mistakes. So, that means Christian had to paint the outline of the motif (in very fine detail), then cover everything else, and to make sure it was thick enough (with no gaps) so that there weren't any stray spots etched. For the buckle and tip, all he had to do was paint on the design and a nice little border. Very nice, in itself, but I was floored when I saw he did the sword and scabbard in a photographic positive, instead of a negative. Well, whether it is negative or positive depends on your point of view, I suppose, but I think of the hilt as positive and the belt as negative. But not in a bad way. Either way you think about it, I'm very pleased with both. The locket and throat of the scabbard. Posted: Thu 27 Apr, 2006 9:21 pm Post subject: Borderwatch came today! I've taken a few quick pictures, just to try to highlight some of the etching. Christian Fletcher's pictures are considerably better, but I wanted to shine some light on the etching in a way that brings out the pattern a little more. Overall, the etching is deeper than the earlier photos show. Also, the patterns are clear, without appearing machine made. It is obvious that a person did it, and I don't mean that in a bad way. The blade itself appears well executed. I haven't cut with it, but there is something about that AT1313 that screams "Don't worry, you can't hurt me. Cut away, I'm made to be used!" Yes, the fuller shows the tell-tale signs of machining. Yes, there is just a bit of waver to the edge, a visible secondary bevel, and a slight unevenness to the tip. But there is something intangible about it that conveys robustness and effectiveness. The fuller should be pretty easy to polish out, should I ever choose to do that, and the waver, unevenness and bevel don't bother me. They are quite subtle and add to the feeling that this was ground by a person and not a machine. 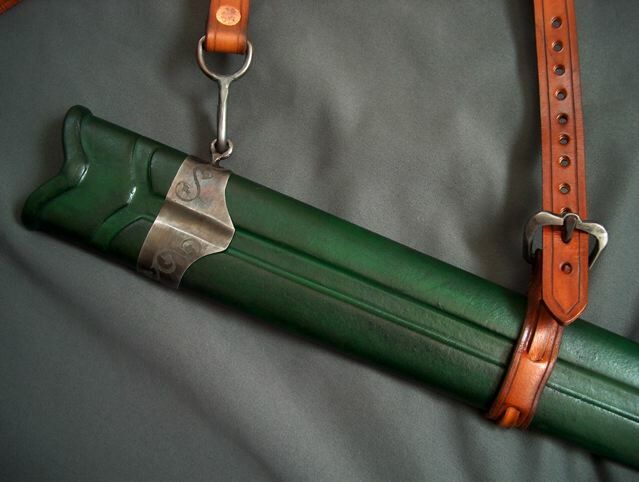 The scabbard is, frankly, a work of art. I've seen CF scabbards before, and this is the best I've seen. You can see the color very well in the pictures, above. The ones I just took are too dark to see the color, properly. The only thing I'm worried about is that the chape was jammed up against the wall of the gun case in shipping, and shifted slightly on the end. I pushed it back into place, and it seems firm enough, but I'll probably need to speak with Mr. Fletcher about how it is supposed to be attached, and whether or not it requires additional attention. The chape itself has no visible seam, unlike many other chapes I've seen. I can make out portions of the seam on the locket, but that is in an inconspicuous spot. Buckle and pommel, end-on view, also showing the pommel nut. The top of the guard, showing how the ectching winds around. 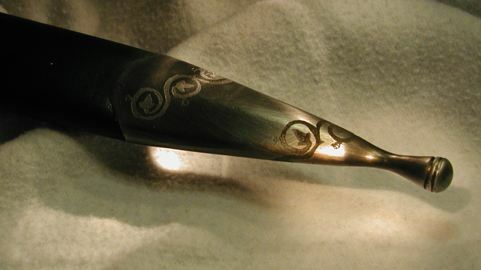 The pommel, side view, showing the etching. 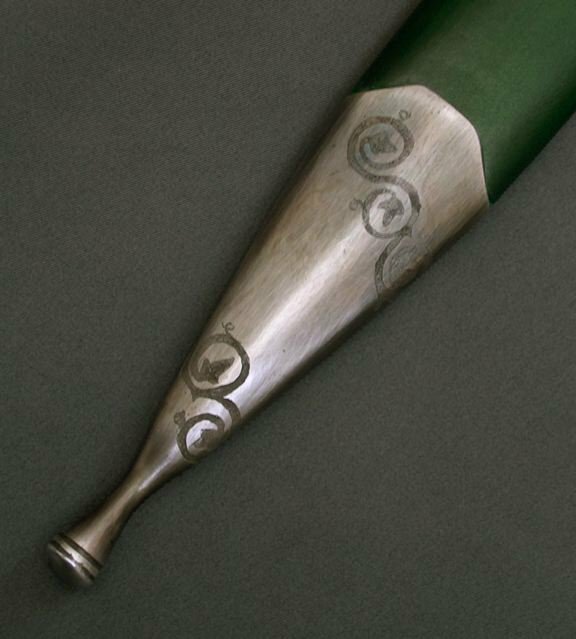 You probably need to see this in person to appreciate the way the etching wraps around the pommel. I took the Borderwatch down to Chad's for a little cutting, and I think it is probably the best cutter I own, and that is saying a lot. The Sovereign, Knight, Regent, and Viceroy are all outstanding cutters. The Borderwatch is certainly suited to me, at any rate. I'm still not very good with form, and only attempted downward, right to left cuts. However, the spacing on the grip allowed me to get up to speed very quickly, and with quite good accuracy. In addition, the shape of the grip made it quite easy for me to keep good blade alignment. I can really tell now, when it is aligned properly. Chad, Joe, and Ted can comment if they like, but I certainly enjoyed it. I did notice one or two things I would like to adjust a little. Chad and I both noticed just a little movement in the grip ring. My guess is that the climate change from Idaho to Ohio resulted in a little movement, and I haven't had a chance to tighten the grip. I'll get an allen wrench the proper size and tighten the nut a notch and see if that corrects it. Joe had an observation or two about the blade, compared to other AT blades he's owned, but I'll let him comment on that, if he'd like. My thanks go out to both Christian Fletcher and Gus Trim for an outstanding piece! Thank you, gentlemen! Doug after a cut with the Borderwatch. Notice how cleanly it cuts. My observation was that finish seems much improved over the Redeemer I had several years back. The transitions and finish at the end of the fullers appears much cleaner, at least to me. 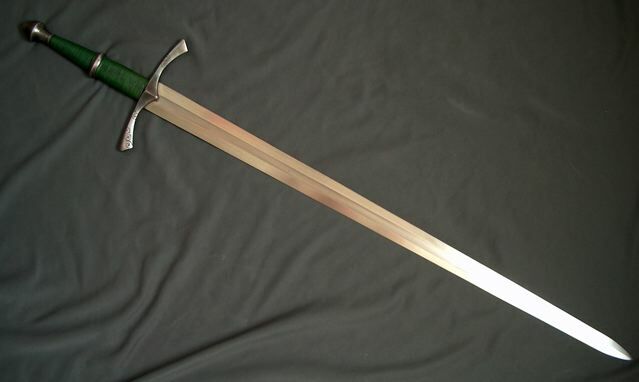 As for cutting , this sword is very tolerant of user error. It does a very good job of cutting cleanly, at least with soft targets, even when footwork, timing, form and alignment are off. A very user friendly creation. Assuming this is a standard finish, feel, and performance at current price points I believe Mr. Trim is putting very compelling value offerings into the market. I'm very glad Doug brought it for show and tell. I was pretty impressed by the Borderwatch. There was a bit of movement in the grip ring and perhaps more between grip and cross. 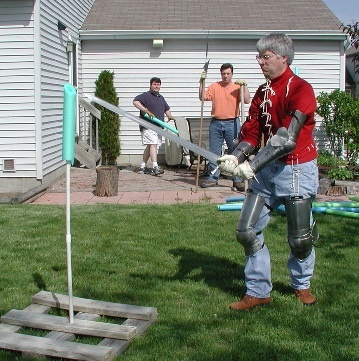 The sword cut very naturally and easy and pool noodles. No problem; no adjustment period to a new blade. The blade finish is better than previous examples I've seen. The fuller is cleaner and more evenly finished, but still shows a different level of finish from the rest of the blade, a rougher finish. Also, you can see where the grinding started for the fuller's termination if you're in the right light. More expensive blades feature a better finish, but well, they're more expensive. The cross-section, as a Type XIIa, could be more rounded and less hexagonal, though there may be historical examples with the next section. A more "typical" blade of that type would be more lenticular in section. All in all, though, this was definitely several steps up from earlier works I've seen from Gus.